Because this is a big ship, there are a lot of doorways and hatches that must be closed and dogged every time you go through. To walk from the lab to the galley via the inside passageway, there are five doors and they are my nemesis. There is no need to work out while aboard the Healy because between opening and closing the doors and going up and down the steep stairways, or ladders, I get quite a workout! It takes most of my weight to latch the heavy steel doors! And to get to the bridge (05 Deck) from the lab deck (the 01 Deck), you have to walk up five flights of steep stairs (ladders) and through many doors. 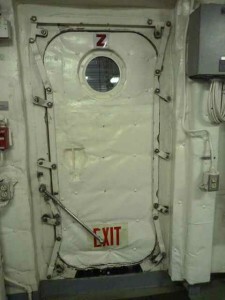 These doorways of course make the ship safer as all the individual spaces are sealed from leaks, etc, but it is quite the workout to get from one space to the next! 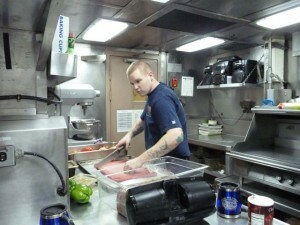 The galley is a vital part of keeping the crew and scientist happy and well fed on the cruise. The cooks do a great job of providing a variety of foods and always a vegetarian option! Plus there are always lots of treats of cookies and cakes to fulfill everyone’s sweet tooth. A few things help to keep me super happy while on board the Healy, one is certainly the coffee shop! The Healy is the only vessel that I have been on that has a full coffee bar where you can get freshly brewed lattes or any coffee drink of your choice. For a few moments, every day, you can get transported and have a latte served to you with a smile while sitting and watching surf movies care of Chris. Morale nights play a big role aboard the Healy. There are soccer tournaments, basketball games in the helicopter hangar, movie nights, and trivia to name some of the organized activities. Along with a few other scientists, I have been playing trivia once a week and it has certainly helped pass some time! 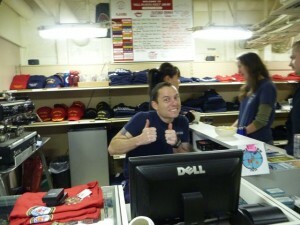 And the crew has been awesome welcoming us to participate in their activities. 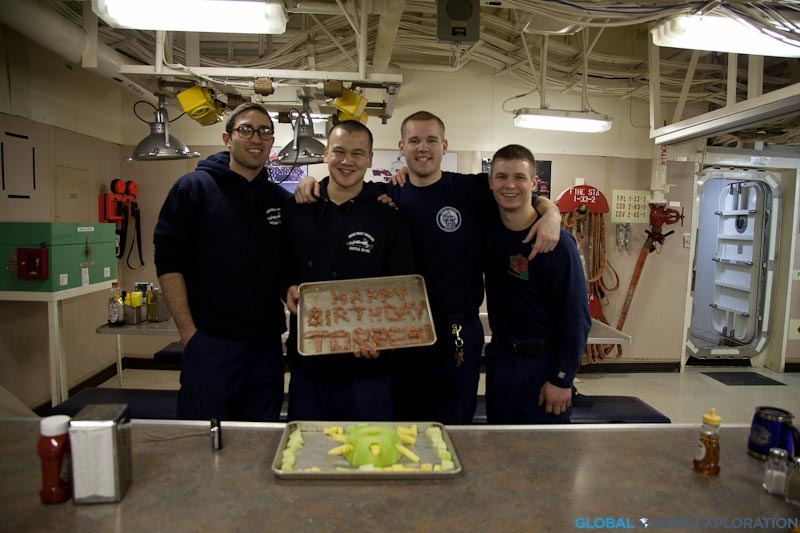 Celebrating a birthday aboard the Healy…Jesse Torres turns 21 and is greeted by some of his favorite treats, spam and fresh fruit, courtesy of Zach Young, Tyyler McNease and Evan Bergeson. © 2019 Global Ocean Exploration Inc. All Rights Reserved.